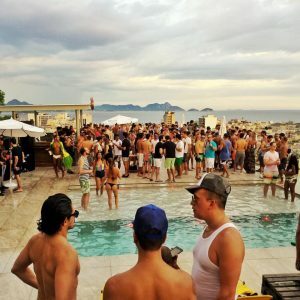 RIO DE JANEIRO, BRAZIL – The Rio Times 7-Year Anniversary Party will be held on Saturday, May 7th, from 3PM to 10PM in Ipanema, and already has over three hundred people interested in attending. 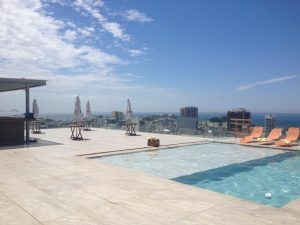 This is no doubt in part because of the amazing location at Casa Mosquito, the boutique hotel offering the use of their rooftop pool area and bar, with breathtaking views of the city. The rooftop and pool at Casa Mosquito, photo image recreation. Casa Mosquito was opened in 2011 by two french expatriates in Rio, Benjamin Cano Planès and Louis Planès. Housed in a former family home, the hotel has four bedrooms in the original building and a further five in a new extension which also features a roof-top bar, swimming pool and 360-degree views of Rio. A recent party at Casa Mosquito filled the rooftop, photo internet recreation. In addition to the amazing location, sponsored drinks by Rekorderlig Cider, and a complete bar and food menu available from Casa Mosquito, music will be provided by DJ Slim. Egyptian by way of England, DJ Slim has become a favorite with his funky-soul sounds and crowd-moving beats. This year’s anniversary party will also have a raffle, with one ticket free as part of the entrance fee. Additional tickets will be sold throughout the day and evening, with prizes ranging from a stylish bag from Gilson Martins, Rekorderlig samples, a free day use at Casa Mosquito to a R$900 package of one-on-one Portuguese lessons from Leblon language school, Portugues Carioca. More prizes and details will be announced this week. Space will be limited so those interested should put their name on the official list by pre-paying for the entrance. Updates of new promotions and partners will be posted on the Facebook Event page.